This penthouse apartment is one of five in an ancient building that can be booked together to accommodate a large group of family and friends. It is located just minutes from the famous Campo di Fiori, or "Field of Flowers", a name given to this area in the Middle Ages when it was a meadow. Since 1869, the Campo is transformed each morning into the fish and vegetable market attracting homemakers, chefs and tourists alike. The ancient fountain that was once used to water cattle now keeps flowers fresh. The Campo di Fiori area is located in the historic center of Rome. The Piazza Navona and Pantheon can be reached in under ten minutes, while the Spanish Steps and Piazza del Popolo are a leisurely twenty minute walk. You can easily walk over the bridge to Trastevere in fifteen minutes. The building is located on a lively pedestrian shopping street. A good pizzeria is across the street, a bakery is around the corner and a supermarket is only a short, five minute walk. Lots of interesting shops can be found on the tiny side streets. Located on the 5th floor, Enter into the foyer and to your left is a bright and sunny double/twin bedroom with en suite bathroom with shower. The laundry room is also at this end of the apartment. On the other side of the foyer is a twin bedroom with en suite bathroom with shower and at the end of the hallway is the master bedroom with a double bed and a daybed that can accommodate another person, perfect for a child or an adult friend. This room has an en suite bathroom with tub and glass shower. The staircase takes you up to the penthouse floor. On the left is a living room with TV and on the right is a kitchenette with a dining table that can accommodate eight guests. 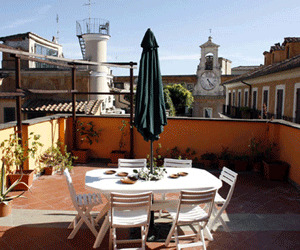 Doors lead out to the rooftop terrace with a table and chairs and views of the rooftops of the Campo di Fiori district. You are in the heart of Rome. The Campo di Fiori area is a lively area and in the evenings, it is a gathering place for the young. It is also active in the early morning when the Romans start setting up the market. The windows are double paned and you are on the top floors, but you may still hear some noise in the evenings.